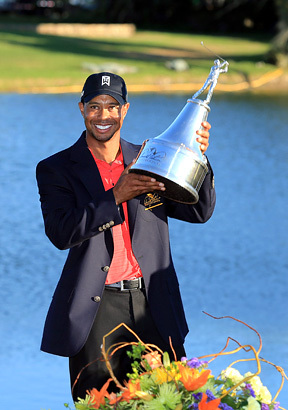 Although Tiger Woods won the Chevron World Challenge back in December 2011 ending his trophy drought, this Bay Hill Arnold Palmer Invitational holds greater significance as it is a PGA Tour event. It is always great to see someone down in the dumps dusting off and getting back on the saddle. We all have had our setbacks in life and this is pure inspirational stuff to spur everyone to get back on their feet. While I do not think that Tiger Woods has what it takes anymore to go back to the glory days of juggernaut magnitude but I still believe he can continue to win titles, albeit not at the dominant rate that was before. He is 5 titles away from overtaking Jack Nicklaus' record and I think he will get there eventually. It may take some time to get the last 5 titles, if not more because at the age of just 36 (still relatively young for a golfer), I feel that he has enough golf in him left to breast the tape at the finishing line.